As I was making corned beef hash the other day, I wistfully realized that I would have to drive over 12 miles outside the city, toward the coast, to the city of Pacifica if I wanted fresh-out-of-the-oven hot pan de sal to go with my corned beef. I suddenly missed home. Pan de sal is the classic Filipino bread. It is actually not Spanish in origin, but Portuguese. Pan de sal means salted bread but it is actually sweeter than it is salty. It is traditionally served as a breakfast roll — buttered and dipped in coffee — but it has made its way to the dinner table. Savory pan de sal sandwiches always hit the spot: corned beef, fried spam, fried egg, fried tocino, or mini-pizza with sweet spaghetti sauce. Or it can be a sweet treat: butter with sugar, sweetened condensed milk, peanut butter with jelly, strawberry jam, mango jam, coconut jam, ube jam, or homemade ice cream sandwiches. Buttered pan de sal also goes well with a hot bowl of champorado. The possibilities are endless. A key thing to remember when making pan de sal is patience. Be patient, let the bread rise, and you will be rewarded with light and fluffy rolls. 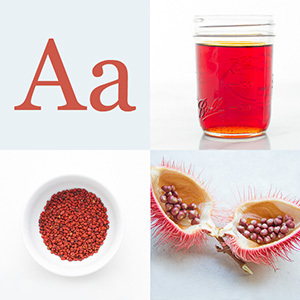 Dissolve yeast in warm water with a temperature anywhere between 100 and 110 degrees F. To proof yeast, add sugar and let stand for 10 minutes. If the mixture doubles in volume then yeast is active. It is very important to make sure that yeast is active. Water that is too hot kills the yeast so make sure that the water temperature is around 100 to 110 degrees F.
Combine flour, sugar, warm water, salt, and shortening in a large bowl and mix until well combined. Add yeast. If the mixture is too wet, add more flour and mix until well combined. On a clean surface dusted with flour, knead the mixture into a smooth elastic dough, for about 10 minutes. 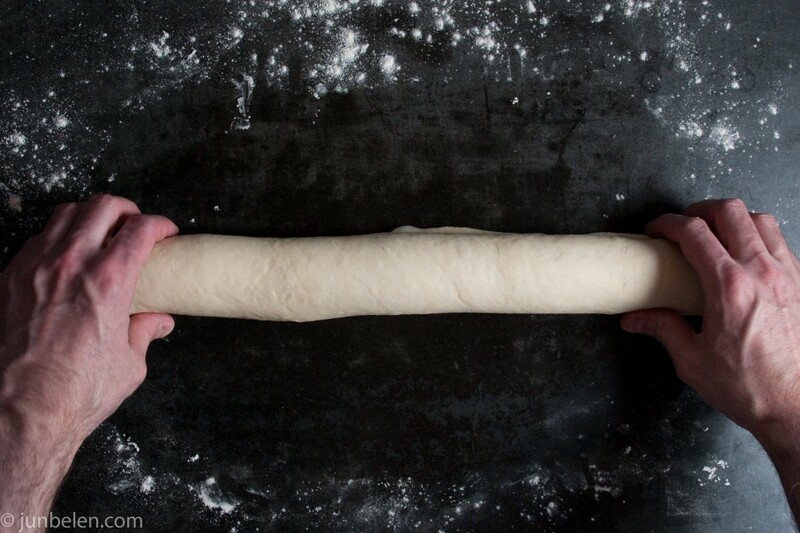 To test the dough if it’s ready, pinch a piece and stretch it into a square. The dough is ready if it’s elastic enough to be stretched into a translucent sheet of dough. If it tears continue kneading. The dough can be kneaded by hand or in a mixer fitted with a dough hook. Grease a large bowl with canola oil. Place the dough in the bowl, cover the bowl with plastic wrap and let the dough rise to about twice its size. 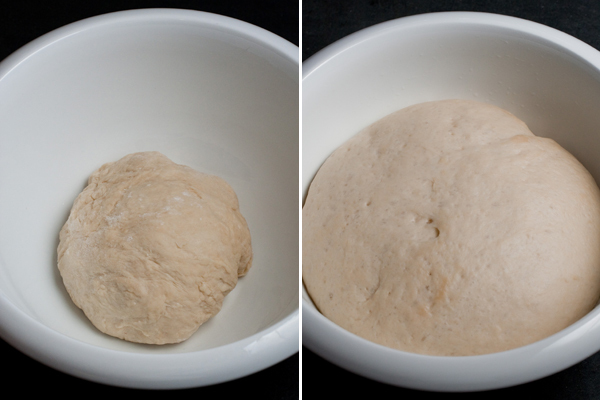 Punch the dough, knead again to redistribute the yeast, and divide the dough into two pieces. Roll each piece of dough into a rectangular sheet and then roll the sheet into a log, about 20 inches long and 2 inches in diameter. Let the dough rest for an hour. Using a dough cutter or a flat knife, cut the log into 1-inch thick pieces. Roll each piece in breadcrumbs, place on a baking tray with the cut side up. Make sure there is enough space, about two inches, between pieces. 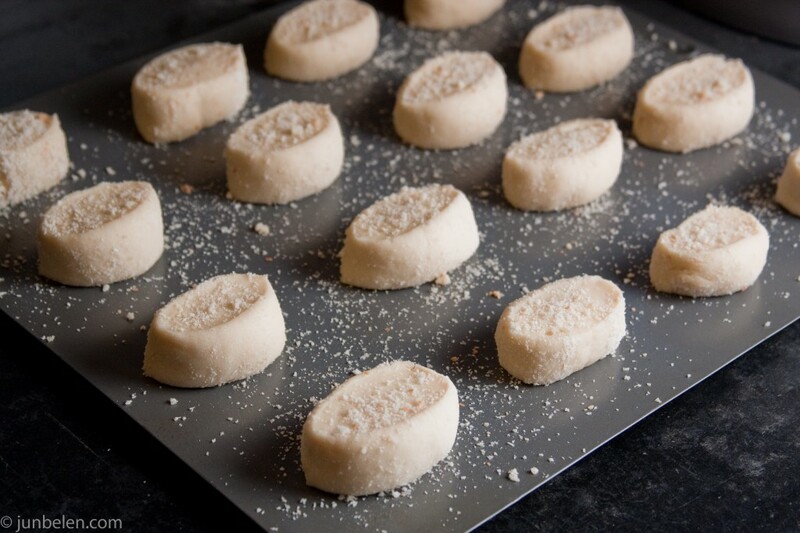 Sprinkle dough with more breadcrumbs and let the dough rest for one more hour before baking. Meanwhile, preheat the oven to 350 degrees F.
Bake the bread for 20 minutes or until the pan de sal becomes lightly toasted. 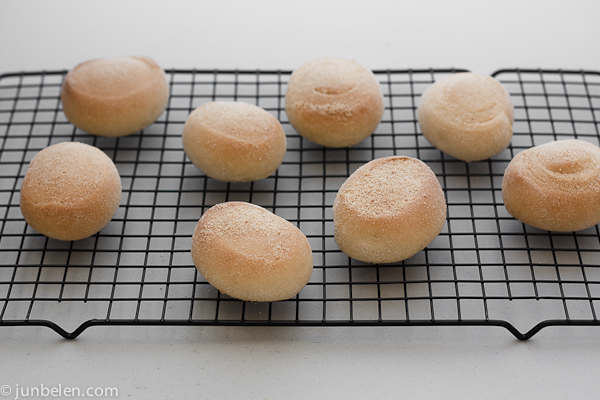 Pan de sal is best enjoyed straight from the oven but these rolls freeze really well. Place rolls in a freezer bag and store in the freezer for up to a month. To reheat them, toss frozen rolls in the microwave or toaster oven. Thank you Jun… so happy with the outcome. Shared your recipe and blog with my friends. GODSPEED!!! Musta Jun. I made your recipe for pandesal kahapon. The best talaga. took me back to wheni lived in the Philippines. Thank you for your blog. Keep it up! What type of bread crumbs do you use? They look great! And thank you for sharing the link with all the beautiful images from back home. They made me homesick! David, apologies for the tardy reply. Thank you for writing and for trying out the recipe. I’m so happy to hear you enjoyed them. Pan de sal with champorado (and tuyo) is the breakfast of champions! I hope you stick around and pass the blog on to your family and friends. Maraming salamat! Marigold, apologies for the tardy reply. Salamat for trying the recipe — they look great! I’m so happy to hear you enjoyed them. Now, you can have pan de sal for breakfast anytime! And thank you for sharing the blog with your friends. Maraming salamat. I usually use the plain breadcrumbs you find in grocery stores. Progresso is one brand. Don’t use the Italian ones with all the seasonings. You can also use panko breadcrumbs but give it a whirl in a food processor so they become finer. If you have time, you can make breadcrumbs from stale bread. Toast and give it a whirl in a food processor to make them into fine crumbs. I hope this helps. Sorry it took a while to respond. Hello Sarah, apologies for the slow reply. I just saw this today. So happy to hear the recipe worked out for you. I think of kneading as a workout! LOL. But I have to admit I cheat and use my Kitchenaid mixer. Again, thank you for following the blog. The breadcrumbs are a big part of what makes pan de sal pan desal. Without it the bread just becomes plain dinner rolls. If you’re going to make pan de sal make it definitely with breadcrumbs. I usually use the plain breadcrumbs you find in grocery stores. Progresso is one brand. Don’t use the Italian ones with all the seasonings. You can also use panko breadcrumbs but give it a whirl in a food processor so they become finer. If you have time, you can make breadcrumbs from stale bread. Toast and give it a whirl in a food processor to make them into fine crumbs. Michelle, maraming salamat for writing and for sharing your experience with the recipe. I’m so happy to hear it worked out for you. I knead my dough with my Kitchenaid mixer, too. And, I guess, we have the same kind of oven. LOL. Thank you again for writing and for following the blog. Ana, the first time I made pan de sal at home I was so excited. Pan de sal from the USA, from california, from my own kitchen! Thank you for writing. I’m so happy to hear the recipe worked out for you. Thanks I appreciate the response! Found the plain breadcrumbs when I tried the recipe and it came out perfect! Thank you!! Thank you for sharing your pandesal recipe! Now my family can enjoy a good hot pandesal at home! gonna try this today…last time nag try aq tumigas ung pandesal….